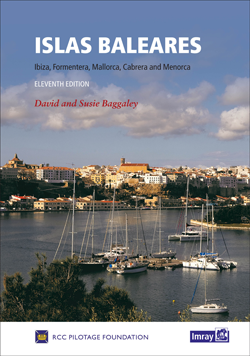 The eleventh edition of Islas Baleares, covering Ibiza, Formentera, Mallorca, Cabrera and Menorca, has been revised and updated for the RCC Pilotage Foundation by David and Susie Baggaley, whose Beneteau 42, Kookaburra has been based in Addaya, Menorca for several years. In their research for this edition, over two seasons, the authors confess to having enjoyed a new purpose to their cruising in the islands, and they share their knowledge enthusiastically and authoritatively. A selection of completely new plans is included, and pre-existing plans have been updated throughout. There are also many attractive new photographs which are informative to the navigator.